CHALLENGE #1 – TAKE SMALL STEPS TO ACHIEVE BIG GOALS! | FITAPPY Fitness & Healthy Plan to Change your Life! ← Well, here I am! CHALLENGE #1 – TAKE SMALL STEPS TO ACHIEVE BIG GOALS! Not much of a challenge, right? Well, I have to start somewhere. I’m aiming very low because I want to successfully complete my first task. It’s much easier to accomplish a few smaller goals than shoot right away for impossible! My real goal, however, is to be disciplined! Yes, Disciplined! I want to stay motivated, work out at least 5 times a week, eat right and write short reports. I hope this will inspire others to jump on board with me. Workout for today: Warm up and stretch. Walk fast for 4 minutes and run for 1 minute. Repeat that 6 times. First 2 running rounds should be easy but 3rd, 4th and 5th I sprinted. Cool down for another 5 minutes. Very mild Sunday workout – just enough to get me started. Running intervals are short (just 1 min) because I ran uphill on a trail. 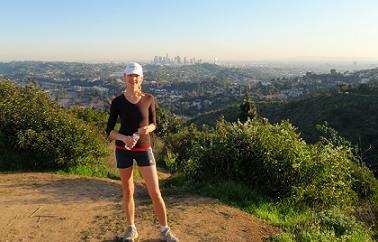 Below is a picture from a top of Beacon Hill in Griffith Park, the place where my trail ended. This entry was posted in Fitness, Workouts and tagged Beacon Hill, Fitappy, fitness, Griffith Park, hike, hiking, Los Angeles, outdoor, outdoor workout, run, running, trail, uphill, workout. Bookmark the permalink.